When I was little, I liked to hang out in my older sister’s room and look at all her things. They always seemed so grown up and cooler than what I had. She had a bookshelf with books (of course), but also knickknacks, little figurines, and photographs. There was one particular photograph that I remember: a photograph of me and my sister with my grandfather. 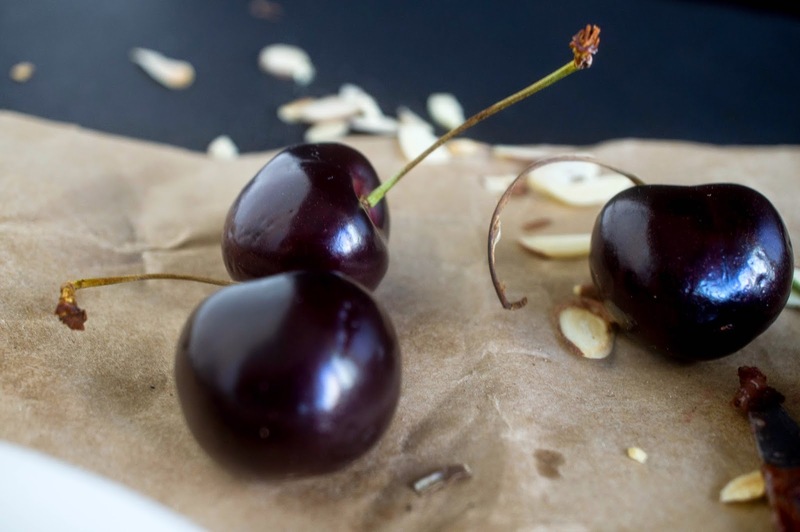 We were on the porch of our cottage in Poland and we were in the middle of pitting cherries, our fingers stained. I was almost four at the time and so I was covered in dark red juice. My grandfather passed away shortly after the photograph was taken, so cherries are inextricably linked with my memories of him. Of course, now I steal gloves from the lab to prevent the red-stained fingers. 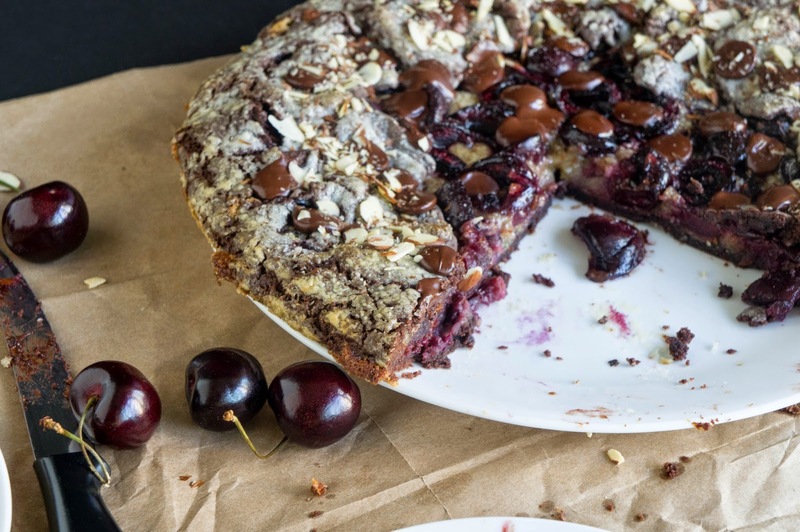 In this recipe, we pile cherries into a chocolate pastry shell and top them with frangipane to make a decadent late summer dessert. If frangipane is a new word in your vocabulary, you should remember it. It’s a sweet topping made with almonds, butter, sugar, and egg that turns into a delicate crisp layer on top of the tart. 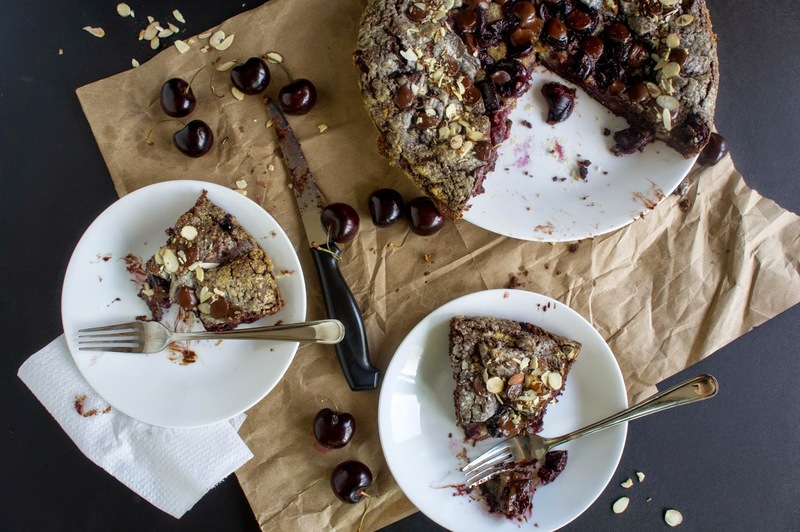 It’s the perfect accompaniment to the juicy cherries and crumbly chocolate pastry. Toasted almonds and melty dark chocolate on top seal the deal. I like to think my grandpa would have enjoyed this dessert, if only to humour his youngest granddaughter. Combine flour, cocoa powder, sugar, and salt in a food processor and pulse to combine. Scatter butter pieces evenly over the dry ingredients and pulse until mixture resembles fine crumbs. In a measuring cup, combine egg and vinegar. Add enough ice water to make 1/3 cup total liquid. Drizzle over mixture in food processor and pulse until a soft dough forms. Remove from food processor, form into a disc, wrap tightly in plastic wrap and refrigerate for 30 minutes. Process almonds in a food processor until finely ground. Add sugar and butter and pulse to combine. Add egg and vanilla and pulse just until combined. Do not over process, you don’t want the butter to melt too much and the whole mixture to get too liquidy. On a large piece of floured parchment paper, roll out chilled pastry into a 14-15 inch diameter circle. Slide parchment and pastry onto a baking sheet and refrigerate for 15 minutes. Once pastry is chilled, but still pliable, spread frangipane into a 9 inch diameter circle on the pastry. Arrange cherries on top. 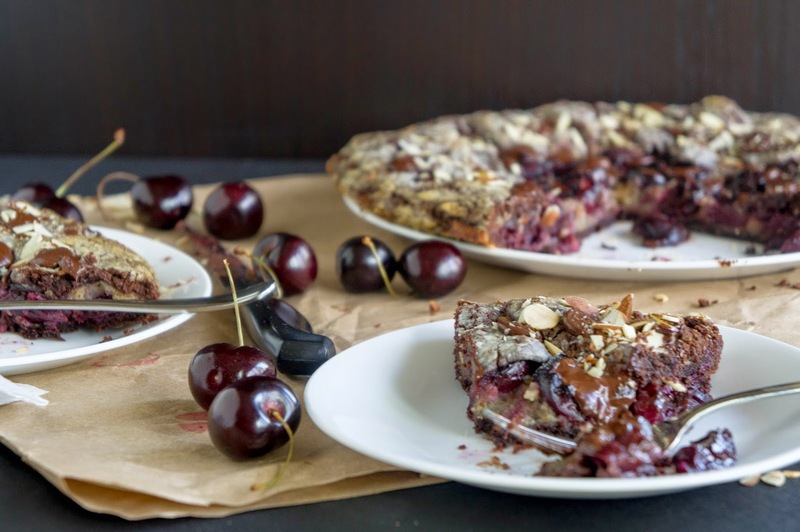 Using the parchment paper to help you, lift the edges of the pastry over the filling towards the center, covering the cherries by about 2-3 inches. Press gently where the pastry overlaps, to seal. Brush the top of the pastry with the cream and sprinkle with raw sugar. Bake in the center of the preheated oven for about 25 minutes, or until pastry is crisp, cherries are softened, and frangipane is set. Remove from oven onto a cooling rack. 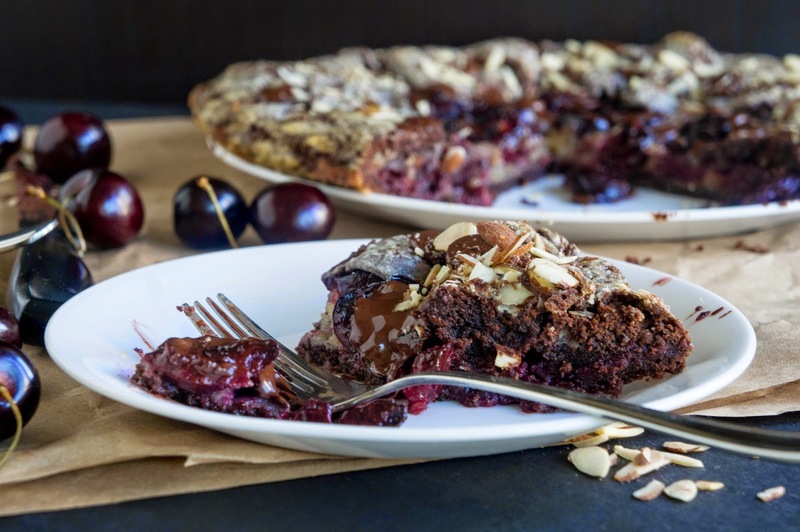 Immediately sprinkle chopped chocolate on hot galette and finish with toasted almonds.